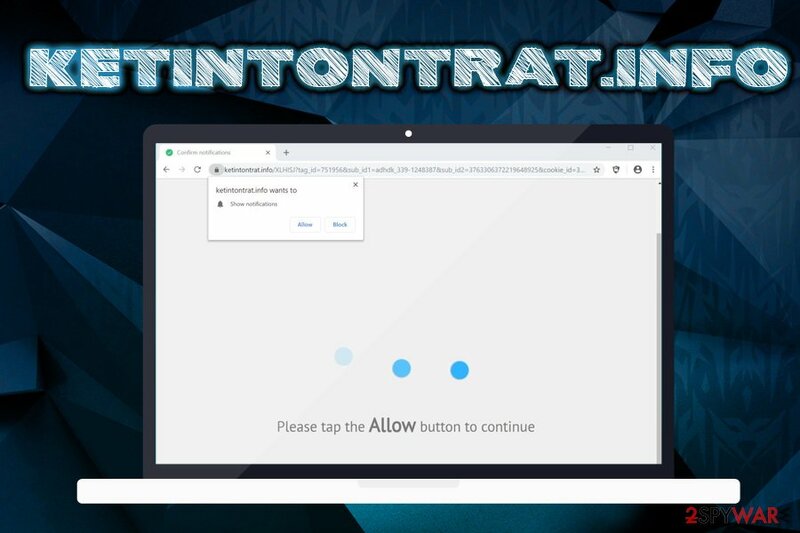 Ketintontrat.info is a redirect virus that modifies the settings of Google Chrome, Internet Explorer, Mozilla Firefox, Safari, Opera or other browsers in order to perform its suspicious activities. Applications that access the targeted machine and alter the way browsers behave without users' consent are called potentially unwanted programs. Unfortunately, such infections are sometimes hard to terminate due to their behavior and obfuscation tactics. Ketintontrat.info is one of many websites that users might get redirected to when they are infected with adware, as such domains like a scam, phishing or even malware-laden ones soon becomes a daily routine. Users are also forced to view endless pop-ups, banners, deals, offers, promotions, and other commercial content. To remove Ketintontrat.info virus' redirection tendencies and other intrusive behavior, users need to find and terminate the unwanted program that is installed on their devices. Potentially unwanted applications like Ketintontrat.info are the pest of the internet and, while not the most dangerous programs out there, are most certainly the most annoying disturbances users have to deal with. Unfortunately, careless online behavior when infected with a PUP might lead to more severe consequences, such as money loss, malware infections or even identity theft. Additionally, most PUPs collect a variety of information that can be later be sold for marketing purposes or even misused by cybercriminals. Therefore, if you notice redirects to Ketintontrat.info or similar sites, your browser is compromised, and it is best not to perform any bank transactions or take on online shopping – the data you enter might be stolen! 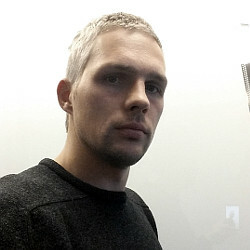 Ketintontrat.info is also social engineering attack that abuses the notification feature that is legitimate tool used by many to receive useful information from sites that are relevant to the particular user (nevertheless, many users are getting annoyed with the push notification pop-ups on most of the sites they visit, with around 52% disliking the feature). However, as practice shows, many dodgy websites adapted this element to generate profits for unknown parties. Never allow these notifications, as it will not enable the alleged video or other similar content. Simply leave the website and take care of Ketintontrat.info removal by either using security software or our manual removal guide below. After termination, we recommend scanning the device with Reimage for best results. Most users are unaware of the deception that lies within software bundling. In fact, the scheme is engineered so that users are less likely to notice all the bonus programs during the installation procedure, as more installs lead to more profits for both freeware and PUP authors. Therefore, it is up to you to stop unwanted programs before they manage to enter your computer and alter web browser settings. Another type of adware programs is those that deceive users with the alleged useful functionality. For example, apps like driver updaters, registry cleaners, junk removal tools, PDF creators, and similar might all be ad-supported. In such a case, users will see ads and redirects and will not be able to connect to anything. Thus, do not download crapware, and check reviews online before installing any type of software you have never heard of. If you go to the installed program list, you will not find a “Ketintontrat.info virus” entry. As we already explained, these type of websites are usually tied to adware program(although you might be redirected to such domains when you click on a suspicious link on another site or get redirected there). Therefore, to remove Ketintontrat.info pop-ups, you will have to find and eliminate the unwanted program that is tied to the intrusive behavior. Here, look for Ketintontrat.info or any other recently installed suspicious programs. Wait until you see Applications folder and look for Ketintontrat.info or any other suspicious programs on it. Now right click on every of such entries and select Move to Trash. When in the new window, check Delete personal settings and select Reset again to complete Ketintontrat.info removal. Once these steps are finished, Ketintontrat.info should be removed from your Microsoft Edge browser. Here, select Ketintontrat.info and other questionable plugins. Click Remove to delete these entries. Now you will see Reset Firefox to its default state message with Reset Firefox button. Click this button for several times and complete Ketintontrat.info removal. Here, select Ketintontrat.info and other malicious plugins and select trash icon to delete these entries. Click Reset to confirm this action and complete Ketintontrat.info removal. Here, select Extensions and look for Ketintontrat.info or other suspicious entries. Click on the Uninstall button to get rid each of them. Now you will see a detailed dialog window filled with reset options. All of those options are usually checked, but you can specify which of them you want to reset. Click the Reset button to complete Ketintontrat.info removal process. ^ Olivia Morelli. What is adware? definition and analysis in depth. 2-spyware. Cybersecurity news and articles. ^ Caitlin O'Connell. The Inside View: How Consumers Really Feel About Push Notifications. Localytics. Mobile App Marketing, Analytics, Engagement. ^ Registry Cleaners: Digital Snake Oil. Malwarebytes Labs. Security blog. This entry was posted on 2019-04-09 at 03:47 and is filed under Adware, Viruses. You can quickly scan the QR code with your mobile device and have Ketintontrat.info manual removal instructions right in your pocket. How did you remove Ketintontrat.info?